Frivols! (Time to Do Another Undone Project) | OccasionalPiece--Quilt! Posted on January 12, 2018 by Elizabeth E.
I think I mentioned somewhere along the way, that I had collected a full set of Frivols tins, shown above. Two other quilters, Kelley and Karen, mentioned that they had a full set, too. I wrote back and forth with each of them, wondering if they wanted to liberate their Frivols from their tins and make 2018 the year that we finally get them done. There is this temptation to leave them fully entombed, I realize. 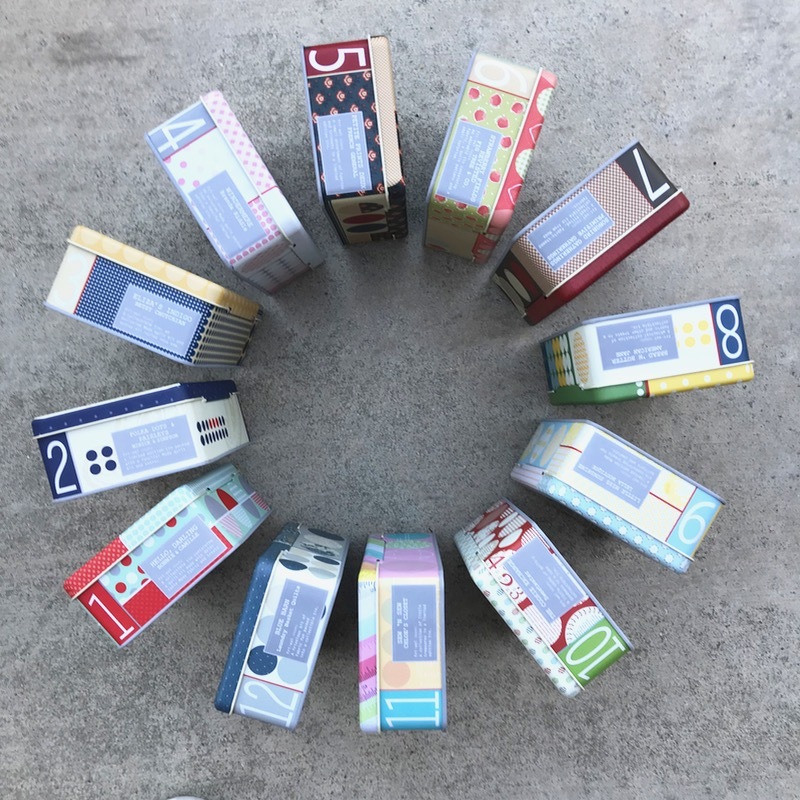 They are so cute in their little boxes, and what will you do with all those little quilts? (Well, some aren’t so little.) But I can think of many places that you can donate these quilts, if you want (try starting with the Preemie unit at your local hospital, or a Domestic Violence Rescue shelter, or your granddaughter’s doll crib, just to name a few). The point is to have fun, to free up space in your sewing room and to get rid of Another Undone Project. If you want to join in with us, too, we’re going to try to tackle one a month until all twelve are finished. If you want to work ahead…well, you have the instructions and the fabrics. You can still find Frivols tins if you do a search, so you can join in the making. Here’s January’s: “Kindred,” using the Hello Darling line by Bonnie and Camille. The quilt finishes at 40″ by 40,” a perfect table-topper size. And here is the Mode blog announcement for how the cutting directions are wrong. It’s true–the quarter-square triangles should have been cut a bit larger; more on that later. I’ll always try to link over to Moda’s blog so you can update any errata/changes in your Frivols. I love how each tin has a little treasure inside. This tin has some woven tape with Handmade with Love written on it. I stacked up two stacks of “twin” blocks–the instructions say to cut using two of the same fabric blocks, and no I don’t know why I have extras (on the left). 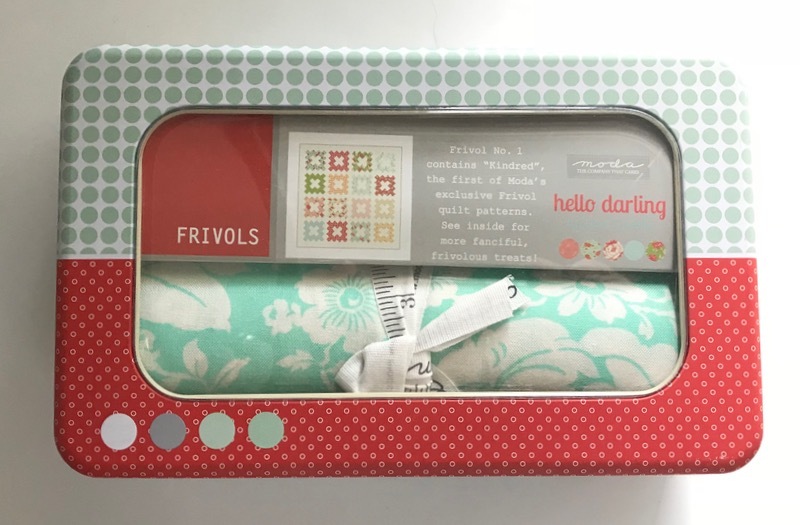 In every Frivol there is a “bonus” block that you can make so you’ll have a sampler quilt. I’m not doing that, so instead I’ll keep the extras in my stash. I cut them according to the sketch. So far so good. I will simply true them up a little smaller when I finish all of them. I’m hooked on this series! If you want to join in, dig out your Frivols tins and let’s get going. 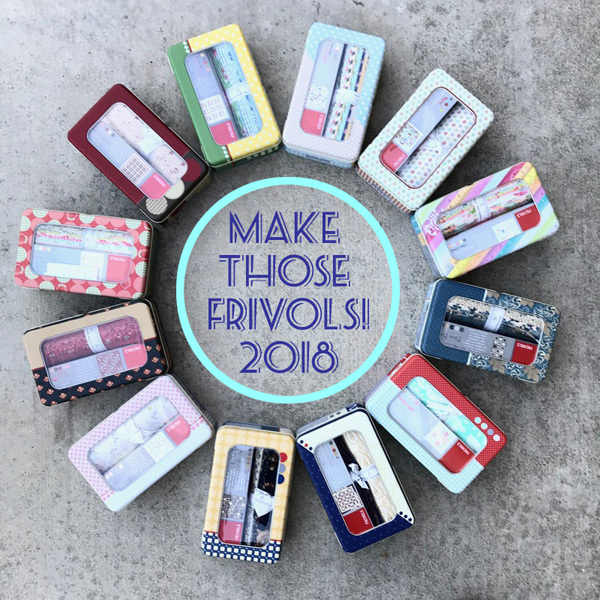 If you leave me your name and blog address or Instagram name, I’ll start making a list at the end of each final monthly Frivols post, with links. Lisa Bongean, of Primitive Gatherings, has a great write-up about “her” tin with her fabric line. Have fun hunting your tins down, getting ready to join up with us. I’ll do an introductory post near the beginning of each month, as well as a final post, on the last day of the month. I would like to commit to getting the quilt top finished each month, with quilting, if I can. As I mentioned, the quilt tops are not too big that you can’t finish them on your domestic machine, and that will give us all a chance to practice our quilting. I’ve got a good start for January’s block, but I’m taking a break to go to Road to California, where I’ll have two quilt tops hanging in the show. I’m also taking three classes, so it will be a busy week. Maisie Hobbs! I devoured the first three books. Kindle makes non-stop reading so easy.. I had to get on with my life, chores, work, family :>) so Maisie is on hiatus. The World War I & aftermath nformation is fascinating. That sounds like such a fun project and the blocks are darling. I also like that design board!! Have fun at Road. That’s neat that you will be working with friends as accountability partners. 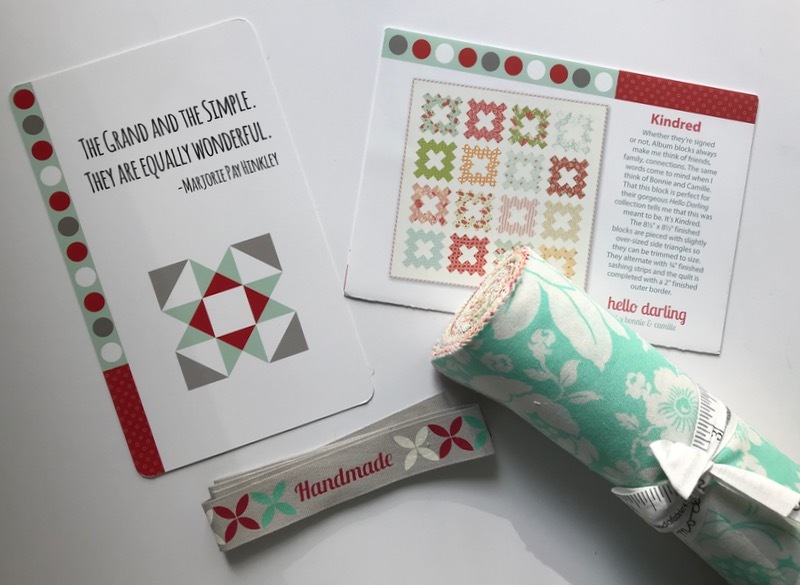 The fabric line is lovely and I look forward to seeing how the quilt comes together for you! I too have the 12 Frivol tins,still to make up. :) I brought an extra 1 or 2 and gave them away as gifts. Maybe I will make 1 a month this year too. Happy Stitching. Good on you for getting these made! Hello! Do you remember where you purchased all your frivols?